The best reality show on television continues, as the New York Giants traded interior defensive lineman Damon Harrison to the Detroit Lions for a fifth-round pick early Wednesday morning. This move comes less than 24 hours after the Giants dealt former first-round pick Eli Apple to the New Orleans Saints. The 355-pound defensive tackle, also known as “Snacks,” has been one of the most consistent producers in the NFL, ranking inside the top-10 in terms of overall grade for defensive interiors in five of the six years he’s played over 200 snaps. His 89.9 overall grade in 2018 places him seventh among all interior defensive linemen. Giants safety Landon Collins, who may be next on the chopping block, was not thrilled at Snacks’ departure, as his Twitter reaction revealed his distaste. Collins has been Harrison’s teammate for the last three and a half seasons and has a 78.2 overall grade on the year. Harrison is a run-stop percentage monster. A stop in the run game is considered a tackle on a run play that constitutes a “loss” for the offense, and it turns out that Harrison forces them more often than nearly anyone else. His 2018 run-stop percentage shows that he forces a stop on 14.3% of run plays, good for third-best in the league among defensive interiors with 70-plus run-defense snaps this season. Oddly enough, the third-place mark can be identified as a disappointment for Harrison, as he maintained the highest run-stop percentage in the league from 2017-2014, ranking just behind J.J. Watt in 2013. Some may classify Snacks as a one-dimensional player, but what he does he is very good at. The only time Harrison has earned a run-defense grade below 87.0 was his rookie year when he only played 22 snaps. Detroit identified a need and pursued the best run-stopper in the league to shore up their 22nd-ranked run defense (73.3 team run-defense grade). The Lions now possess three of the top-15 highest-graded interior defensive linemen, as Harrison will get to play alongside ninth-ranked Da’Shawn Hand (89.6) and A’Shawn Robinson, whose 84.7 run-defense defense grade ties Ndamukong Suh for the 14th. Hand, who has the highest overall grade among all rookie defenders, affects both phases of the game, as he ranks 14th in run-stop percentage (10.8) and holds an 88.0 pass-rush grade on the season. 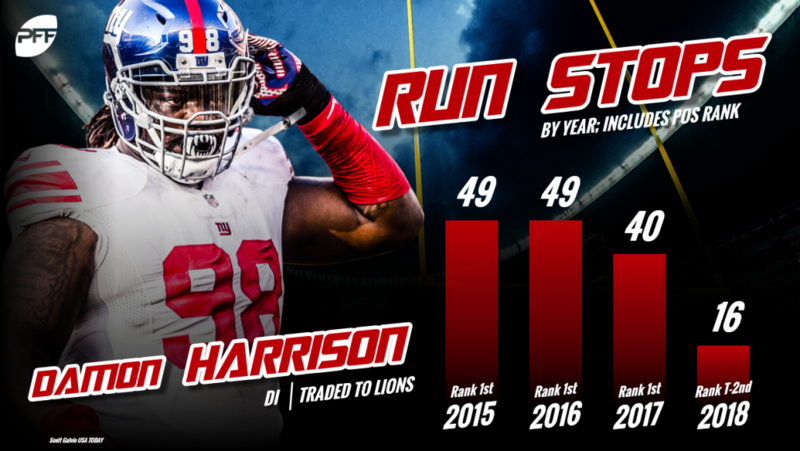 Hand and Harrison will be a duo that you go out of your way to watch this season, rivaling the likes of Los Angeles Rams’ Aaron Donald and Suh. The Lions may struggle to contain the run on the outside of their defense, but they’ll be a run-stopping force when opposing teams attempt to run between the tackles. Detroit got a steal from New York in their deal for a player that any team in the NFL would’ve been delighted to have.